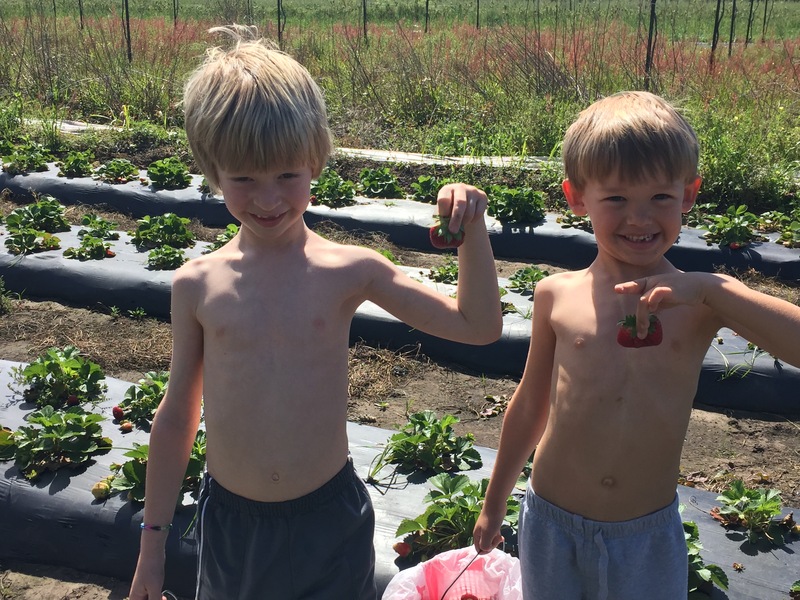 One of my favorite things to do every spring is pick strawberries. We have been going to Ambrose Family Farms since before the kids were born. I’ve missed a year or two but it’s a tradition that I love so I try to go once a season. I’ve had good years and bad years as far as the kids are concerned. Last year was a little rough, read about that here. This year was perfect. 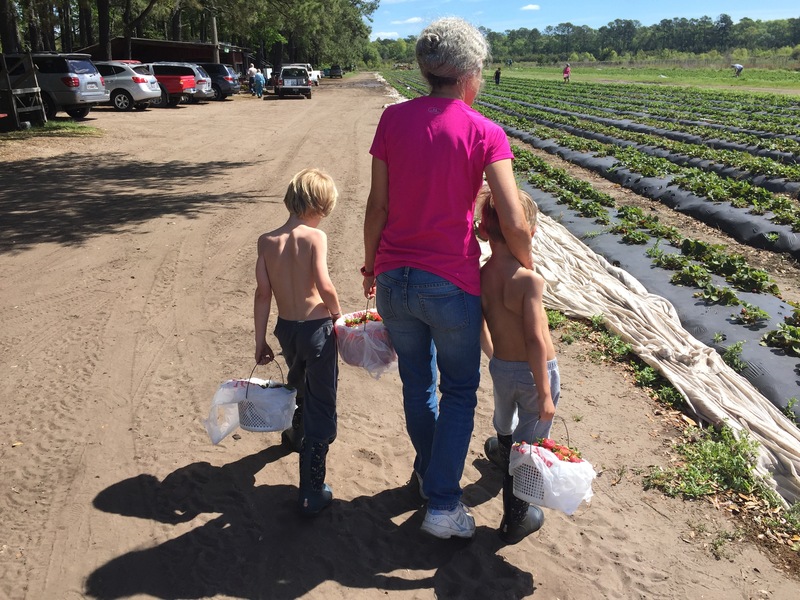 It was a beautiful day, not too muddy, not too hot, plenty of ripe strawberries and Tutu came a long. Here are some pictures from the day. 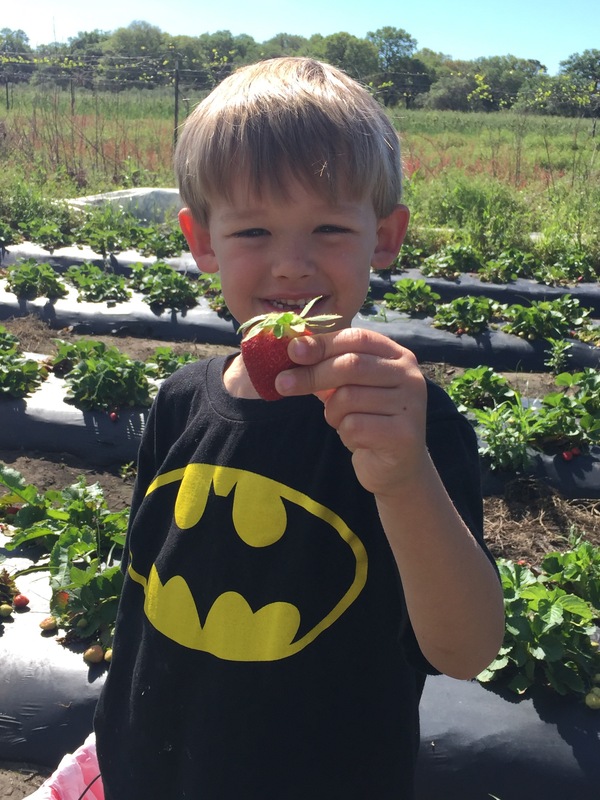 Scroll to the bottom for details on the farm and other local strawberry spots. We went on Monday and there were plenty of ripe strawberries but lots of green ones too. I think the picking will be good for a couple more weeks. It warmed up pretty quickly and they shed their shirts! I could eat these two up . . . the strawberries too. The boys and Tutu (Luke’s mom). The little shop where you pick up your basket and pay for your strawberries. We met an older man standing in line who shared that he had 6 kids, 23 grand kids and 49 great grand kids . . . yes, 49. Let that sink in. I was speechless. 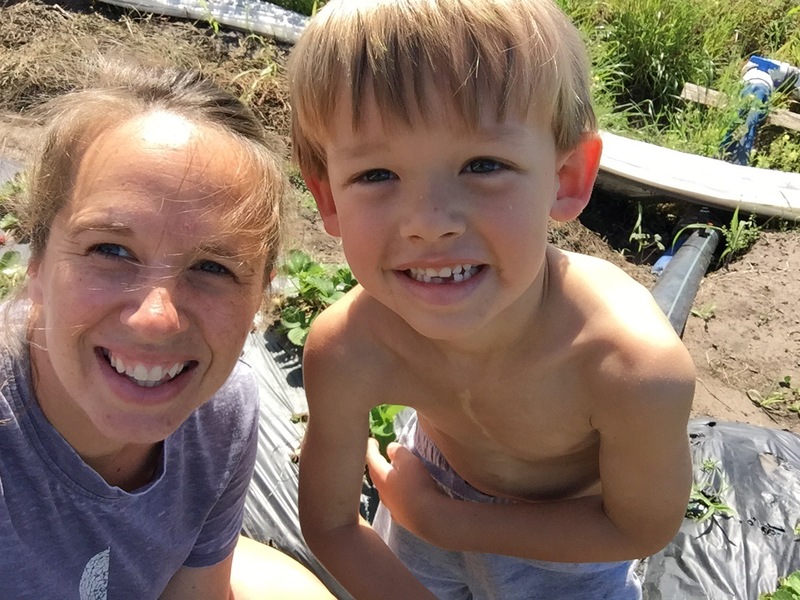 Ambrose Family Farms is a multifaceted venture. They have a farm where they grow things as naturally and organically as possible. 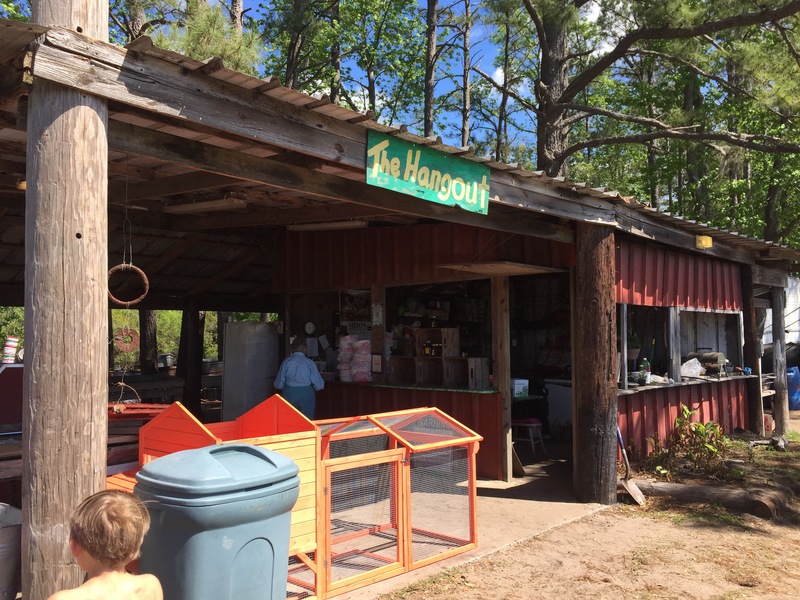 At the Stono Market and Tomato Shed, they serve lunch, sell baked good as well as their harvest. They also host a CSA program. We were members of their CSA for many years. A CSA or community supported agriculture program is where you buy a seasonal box of veggies that is delivered weekly to a location of your choosing. Basically you pay a flat rate and you get a box of fruit and veggies every week. You don’t get to pick what’s in the box, which we really enjoyed. There were many weeks where we would have to look veggies up to figure out what they were and how to cook them. I had never had bok choy, turnip bulbs, or a few other more obscure veggies before joining the CSA. Check it out here if this is something that interests you. Anyway, the strawberry picking season varies a little from year to year. Here is the website. I recommend calling before going. They close on rainy days and some Sundays. They can also tell you things like whether a large group has just come through and cleaned out the days harvest. 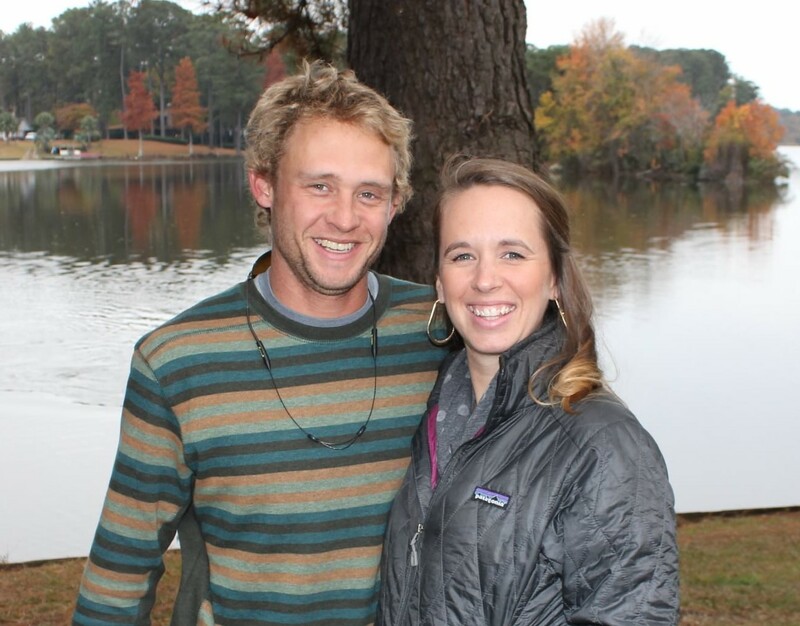 Address: The physical address is: 2349 Black Pond Lane, Wadmalaw Island, SC 29487. Some GPS systems do not recognize this address. If yours does not recognize Black Pond Lane, use Selkirk Plantation Road, Wadmalaw Island, SC 29487. *This is pretty far out in Wadmalaw, but it is a straight shot and very easy to find! Hours: Monday-Saturday 9am-5pm, open some Sundays. Closed if raining. Don’t wear nice clothes. You will likely be covered by sand, mud, strawberries or all three by the time you leave. Consider having an extra set of clothing for everyone in the car. Rain boots are always a good footwear choice. Some years it’s very muddy. Wear layers. As you can see from my shirtless boys, it was hot this year. However, we were chilly when we left the house. Bring water and snacks. Hungry kids. Enough said. 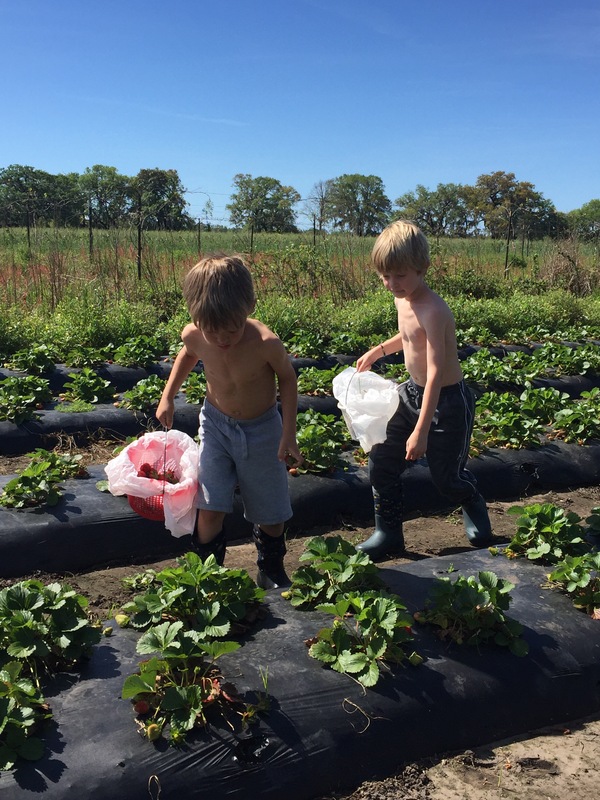 They will have plastic grocery bags for you to take the strawberries home. You might want an old towel or tarp to put them on in your car in case the bags have holes in them or strawberries spill out. While not ideal, the rows are wide enough for a stroller or wagon. 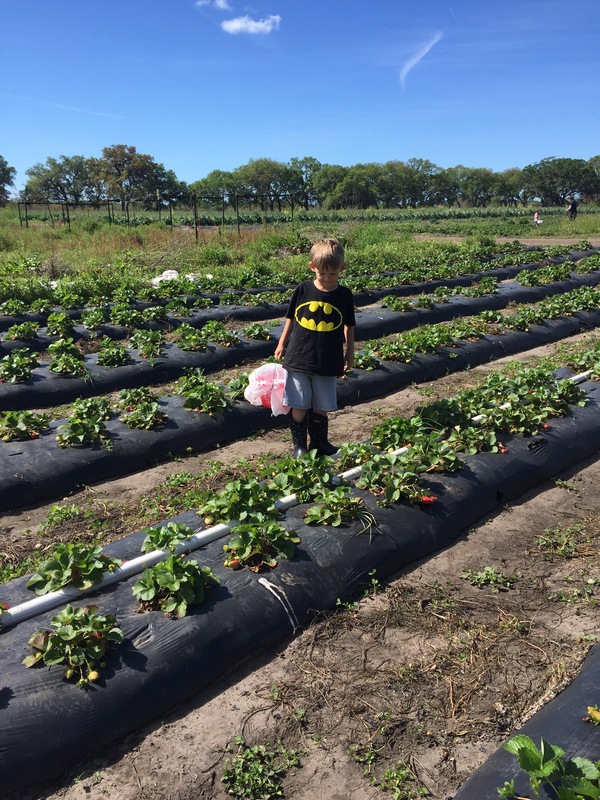 Here is a list of other you-pick strawberry farms in the Charleston area. This year we picked about 11 lbs. I froze most of them to use in smoothies. Lay them on parchment paper on a cookie sheet in a single layer. Put them in the freezer. Once frozen (about 24 hours) move them to a freezer bag or other container. We all love smoothies with strawberries (or other frozen fruit), banana, plain greek yogurt, spinach, honey and a little water, juice or milk.